Barcelona are reportedly stepping up their transfer interest in Tottenham playmaker Christian Eriksen despite recently bringing in Philippe Coutinho for their attack. The Catalan giants could do with the Denmark international as a long-term replacement for ageing midfield duo Andres Iniesta and Ivan Rakitic, and is one of the finest creative players in Europe at the moment. Eriksen has become increasingly important to Spurs in the last few seasons, hitting the form of his career under manager Mauricio Pochettino, and it’s little surprise to see bigger clubs being linked with him. The 26-year-old is now said to be emerging as more of a target for Barcelona in recent weeks, Don Balon claim striker Luis Suarez has learned. There’s no doubt Eriksen looks like a player who’d suit Barca’s style of play and could form an effective attacking midfield partnership with Coutinho as well as others in Ernesto Valverde’s line up. 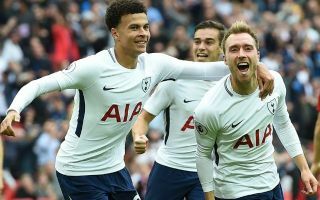 Tottenham certainly won’t want to lose as important a player as Eriksen, who along with Harry Kane and Dele Alli is a vital member of this side that has grown as a force in both the Premier League and Champions League in the last couple of seasons. Spurs unfortunately have a history of losing their stars to bigger clubs, with Luka Modric and Gareth Bale recently being snapped up by Real Madrid, while Michael Carrick and Dimitar Berbatov ended up at Manchester United in just over the last decade. Still, the north Londoners have grown since then and may have increased hope that they can fulfil the ambition of a top class player like Eriksen.